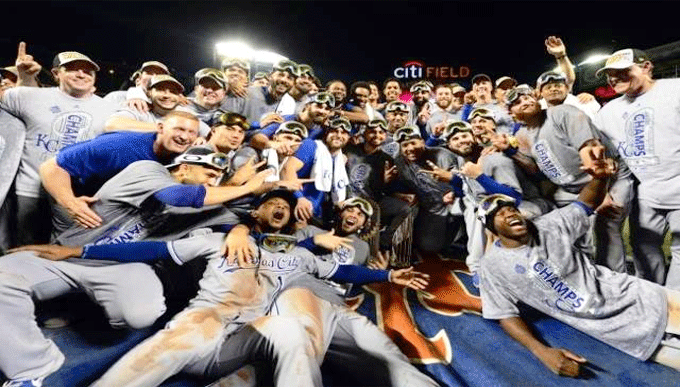 The hardware continued to pour in for the Kansas City Royals following their tremendous World Series title. Alcides Escobar, Salvador Perez, and Eric Hosmer all brought home Gold Gloves for 2015. Alex Gordon game up short, and for some inexplicable reason, Lorenzo Cain wasn’t a finalist in center field, but nevertheless, the three that won were well deserving. Adding to that was DH Kendrys Morales taking home the Silver Slugger award, given to the league’s top designated hitter. Morales hit .290 for the year, crushing 22 homers and knocking in 106 RBI’s for the Royals. In all, the Royals will have to clear out some series space in the trophy case at Kauffman Stadium to house the hardware coming to KC. Despite the accolades, the Royals continue to work through winter GM meetings and the offseason to figure out what decisions need to be made regarding the roster. As time goes by, it appears as though long-time Royal and fan favorite Alex Gordon, will ultimately command too much money for the Royals to keep him while keeping their future roster situation financially viable, considering the contracts of players such as Mike Moustakas, Eric Hosmer, and Lorenzo Cain are expiring. There is zero doubt that Dayton Moore and Ned Yost would like to figure out a way to keep Gordon, and if he is willing to take a likely considerable home-town discount, the local favorite may have the opportunity to finish out a tremendous career with his dream team. Should he opt to take advantage of what should be his last big contract–potentially upwards of $100 million–not a single teammate or fan will criticize him for it, regardless of the sadness which will follow his departure. The other pressing issue is the status of Ben Zobrist. After coming over at the trade deadline, Zobrist instantly became one of the better pieces to the team and won over the heart of Kansas City with his play. Zobrist seems to fit the Kansas City Royals style of baseball, and by all accounts, has enjoyed the city. At 34, Zobrist doesn’t appear to be slowing down, but may only garner a 2-3 year contract, but one which will require a team to pay a hefty price. Recently, the New York Yankees indicated that Zobrist is too rich for their blood on a shorter deal. Any player being considered too rich for the Yankees is worrisome if you’re the Royals. The Mets, on the other hand, have indicated an interest in Zobrist, which would be ironic to say the least, considered his multitude of big-time plays which led to the defeat of the Mets in the World Series, not to mention signing with them would result in a visit back to Kauffman Stadium in the 2016 home opener, which would include the Royals being given their World Series rings…AWKWARD. The Royals would be wise to sign Zobrist, who can play the utility role and move between second base and left field–a gap which would open up should Gordon sign elsewhere. In all likelihood, Kansas City won’t sign both, so the announcement of an extension for one or the other would almost certainly uncover which of the two will be heading to a different ball club. Missing out on both players should be considered a blow to the roster, and although the core group is still around and the Royals have prospects waiting to make their mark on the team at the big league level, either one or both of Zobrist and Gordon automatically make the Royals a championship-caliber team. The 2016 season will arrive before you know it, so be sure to make Tickets For Less and Tickets For Less your source for tickets to each and every home game at Kauffman Stadium next season. With zero hidden service fees, what you see is what you get, unlike many of our competitors which tack on charges at the end of your purchase. Don’t miss out on your chance to cheer on your 2016 Kansas City Royals as they’ll try and defend the crown!